JPN Brush House provides a huge range of Deburring Brush. Deburring Brushes are ideal for use on flat surfaces. 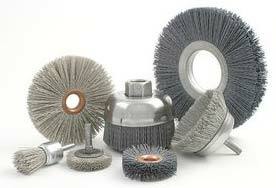 Our range of Deburring Brush includes wheel, end, tube and disk brushes. Clients can avail the Deburring Brush from us in different sizes, shapes and specifications at the market leading prices.